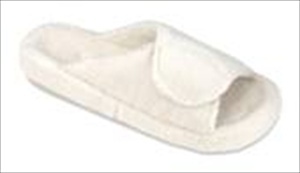 Earthsake has the new Spa Slide Slippers and at a better price than ever before!! These Vegan slippers are as comfortable as they are free of animal byproducts. With cozy fabric, sleek design, and velcro straps, these slippers bring the spa to you. -Soft spa terry uppers and linings wrap the foot in comfort. -Skid-resistant weatherproof sole for indoor/outdoor wear. -Easy care, machine wash and dry.